Nitri-KoteTM general purpose work gloves by North Safety Products provide superior abrasion resistance, excellent grip and are long wearing. Nitri-Kote will outwear vinyl coated and impregnated, leather, fabric and PVC coated string knit gloves. Superior resistance to abrasion, excellent grip, long wearing Nitri-KoteTM Gloves. With the introduction of the Nitri-KoteTM Glove, North Safety Products announces a unique, new way of coating tough nitrile on a comfortable string knit shell. The result is a glove that has superior resistance to abrasion, excellent grip, and comfort for the worker. Unlike other coated string knit gloves, the Nitri-Kote is totally covered by a breathable, tough nitrile coating. This includes the fingertips and sides that typically wear out first on string knit gloves. And, unlike vinyl impregnated gloves, Nitri-Kote is cooler to wear for greater worker comfort. Nitri-Kote gloves from North will outwear vinyl coated and impregnated, leather, fabric and PVC coated string knit gloves. Unlike PVC gloves, they can be dry cleaned without stiffening. And since they are ambidextrous, they can be worn on either hand, so they require no sorting after recycling. Nitri-Kote gloves are ideal for use in automotive assembly operations, shipping/receiving, maintenance, and general plant use. 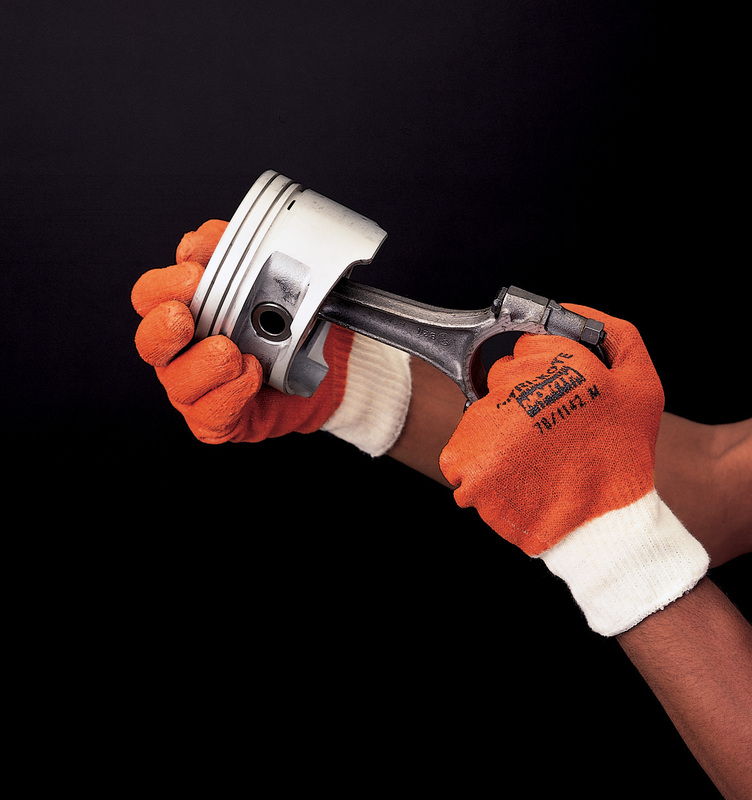 Unique Nitrile Coating Allows glove to be fully coated for long wear, yet breathable. Blended String Knit Shell Cotton comfort, reduces shrinkage when recycled. Ambidextrous Can be worn on either hand. Long wear because of four wearing surfaces. No need to sort after laundering. May be Dry-cleaned or Laundered Reduces glove cost. Seamless Construction Superior comfort, lessens hand fatigue. Contact North today to learn more about the Nitri-KoteTM Gloves. Call us toll free at 888-422-3798, or email us at marketing marketing@northsafety.com.